Without a doubt the Ausangate trail offers some of the most wonderful scenery in Cusco area, with many birds and wildlife and also glaciers and high alpine lakes. Its also one of the most challenging in the region with three high passes over 5,000 meters/ 16000 feet. Apu Ausangate dominates Cusco's southern skyline. As we draw closer to this massive. 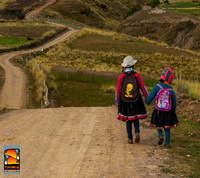 Ausangate Trek offers you a real taste of the Andean life, as you will find and see little communities where native still speak the Inca language and where traditional methods of life are still used. 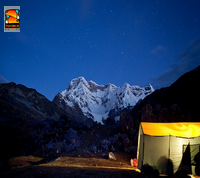 Discover the unexpected & enjoy an impressive range of mountains which includes the highest peak “Ausangate”. Observe the spectacular wildlife, including vicuñas & Andean birds. Day 03: 17 km / 10,563 miles. Day 04: 14 km / 8,699 miles. 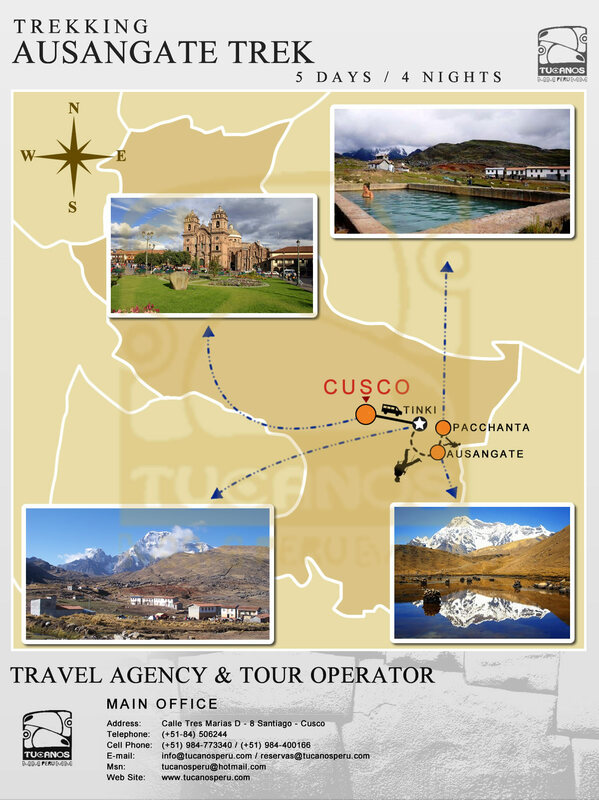 We depart Cusco early the morning for our three hour ride in private transport to the small village of Tinqui (3800 meters/ 12 464 feet). As Tinqui is located on the new Interoceanic highway we can now arrive here much more quickly that in previous years. We pass through beautiful countryside and several traditional villages including Urcos, Cattca and Ocangate. After lunch in Tinqui the first 3 hours on the trail are wonderful prelude to the magnificent scenery of the Cordillera Vilcanota, with great views of Ausangate. We will trek for two hours more until we reach the hot springs at Upis (4,400 meters/ 14432 feet) which offer fantastic views of Ausangate at the end of the valley. We will camp here for the night. During our morning's trek, we will cross the Arapa pass (4,850 meters/ 15908 feet). From here, we continue 3½ hours down the valley, passing the green lake of Puqa Q'ocha until we reach the turquoise Lake Jatun Puqa Q'ocha. We then ascend the second pass of Apuchata (4,900 metres/ 16 072 feet) with the stunning turquoise blue Laguna Ausangate Q'ocha below. This lake is fed from the melting snow of Ausangate. We will camp here for the second night. From the lake we ascend to the Palomani pass (5,200 meters/ 17 056 feet); the highest point of the trek. From the pass we follow the trail into the valley where we will rest and have lunch. During the afternoon we can enjoy views of the snowcapped Tres Picos and Puca punta. We will continue through the broad green valley of Pampa Jutunpata and up the Rio Q'ampa valley. We will spend the night community. After breakfast It is only 3 hours trek back to Tinqui where we will have time to explore this traditional Andean village before taking our private bus back to Cusco. What is Included? : What is not Included? Private bus to the start of the trek. Transfer to your hotel on return. Camping equipment, dining tents, kitchen, tables, chairs. 4 man tents are provided for 2 people only. First aid kid and oxygen tank. Water sterilizing tablets in case you collect water from streams. * We include a porter that will carry your personal belongings (8kg/16lbs) in all of our treks at no additional cost.